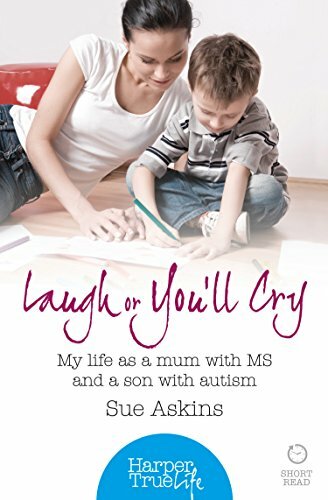 My Book – "Laugh or You'll Cry"
Within the space of just over a year, my life was entirely transformed: this book follows my journey through that challenging time. It is the story of coming to terms with our older son’s autism as well as trying to deal with my own diagnosis of Multiple Sclerosis, except I never call it that- MS sounds a lot less alarming. I tend to go to great lengths to hide my illness; don’t want the fuss, hence the title. Yet, far from being a sad tale, the story is up-beat, encouraging and, at times, very funny. My book should be a pick-me-up as I have written about my family’s exploits in a down-to-earth style with humour. I don’t want the book to come over as a gloomy read, but uplifting with a hint of conscience. It offers an insight into how, at 35, your life could completely change, and it is told in such a warm and humorous way we all are able to relate to it. It has taken over ten years to write, and has been rescued from the recycling bin more than once!